"EMBRACE YOUR WIERDNESS" features an original, abstract painting created in a rainbow color palette against the natural white tones of the watercolor paper. 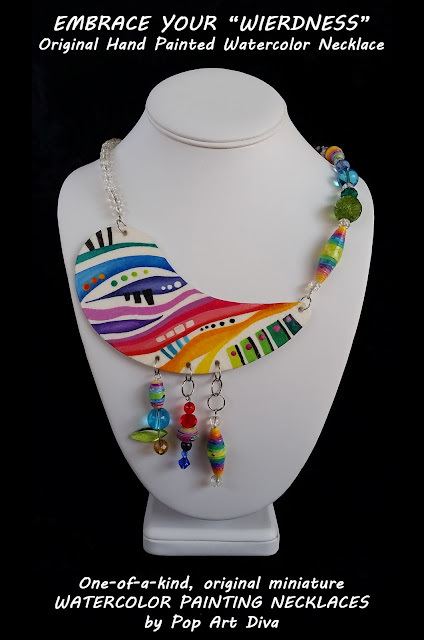 The crescent shaped painted pendant is flanked on one side by custom matched, hand painted paper beads and a rainbow pattern of glass beads including 2 specialty beads, an amber heart bead and a cracked glass bead. The other side is a simple strand of clear glass beads. 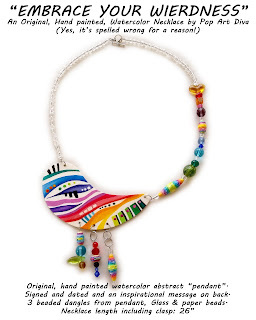 There are 3 dangles from the pendant which also feature a rainbow of bead colors and 3 paper beads, one on each dangle. The back side features a hand written, inspirational message that complements the necklace. (See photos below). FREE SHIPPING. Painted pendant measures 5-1/4" wide by 2-5/8" high. The pendant thickness is 1/32" thick. Primary colors: Rainbow - The color spectrum. * WHY IS WEIRDNESS SPELLED WRONG? 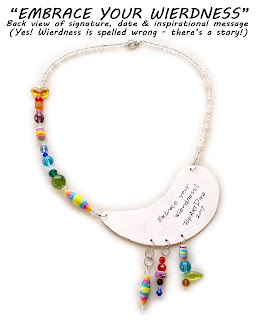 * I had a very dear friend, a wild Aquarian who never quite exited the sixties hippie phase. She was scattered, brilliant, unpredictable and more fun than anyone else I've ever met. She was also an artist and very inventive. 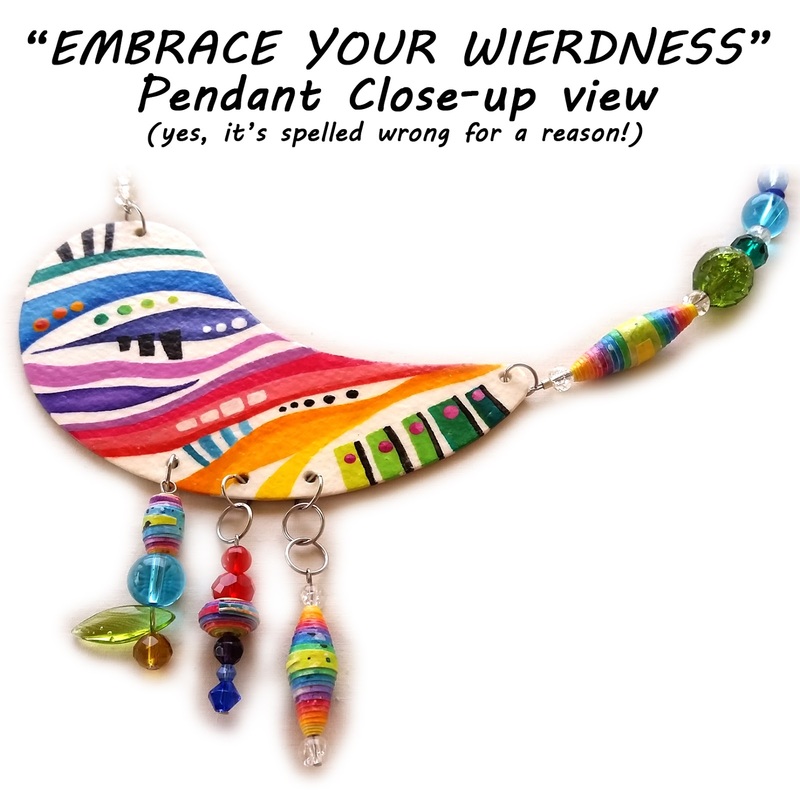 "Wierd" (pronounced wy-eared) was her term for me, an amalgam of wired and weird, actually pretty right on. Cracked me up every time she said it. The day I worked on this I had a very intense dream of her and couldn't get her off my mind so ... this is my tribute to her, our adventures together and our thirty plus years of friendship. RIP, Betty. You have been and always shall be my dear friend.